Is your favorite segment from “Our State” among our five most-watched? Check out this list as we count down the most popular segments on our YouTube channel. 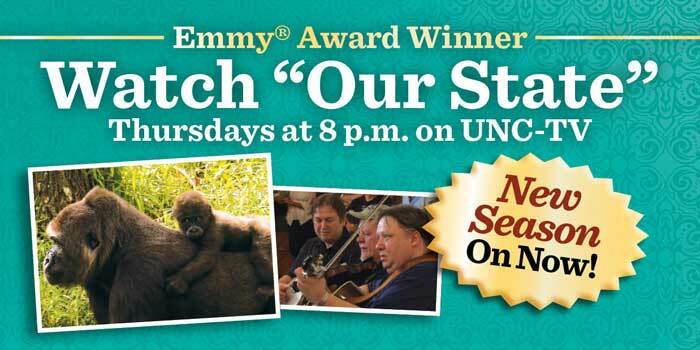 Inspired by the pages of Our State magazine, UNC-TV’s half-hour monthly series, “Our State,” takes you down-home in North Carolina for an in-depth look at the people and places that make our state great! Since it’s inception, “Our State” has won ten Emmy® Awards for outstanding series and production. The new season begins October 3, 2013. Since the series began in 2004, many segments have become fan favorites. Below is our countdown of the 5 most-watched episodes from Our State‘s YouTube channel! Weigh in below with your comments and your favorite segments from the series. In our third season, we wandered below ground and discovered a unique geological kaleidoscope. From our first season, this segment captures the beauty of all seven of our state’s brightest beacons. Davidson was our featured Tar Heel Town during our third seasons. D.G. Martin takes you along to this quintessential college town. From our very first season, this video of blues guitarist Etta Baker captures a true musical treasure at work. Though Baker died in 2006, her legacy continues to shape North Carolina music and musicians today. If you rode the school bus in North Carolina since 1936, there’s a good chance it was a Thomas Built bus. Go behind the scenes of the company that has been making the ubiquitous yellow buses for several generations.